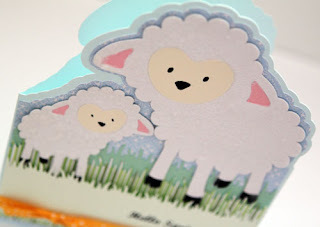 I have received a few private messages from the Cricut mb asking how I did the card base for yesterday's lambie card. I figured that I would just post it here instead of replying one message at a time. Please click on the image to view in a larger size. I have written my instructions on the image above. If you have trouble viewing the picture, please let me know and I will try to fix it. 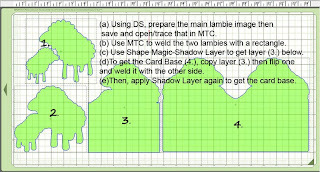 I have also included the MTC cut file here for you to download. It will include layer 3 and layer 4. They are ready for use for lambies cut in 3" (baby) and 5"(mom). If you download the file, please leave a comment so I know that the download works. I am not affiliated with the company that made MTC. Click here to download the MTC file for the card base. I bought the Easter seasonal cartridge 2 weeks ago and finally had a chance to make something with it today. The baby lamb was cut at 3" and the mommy was cut using the same image but at 5" and flipped using the Flip function. I also applied flock on the lambs. Martha Stewart's Grass Edge Punch was used to make the grass border. 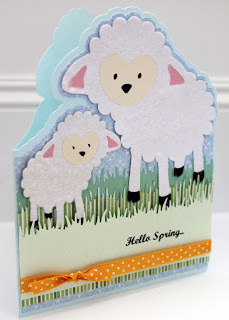 The card base was cut with MTC and "Hello Spring" was computer-printed with MS Word. 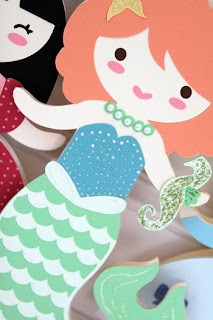 A little over 12 hours ago I made a post on the Cricut forum about my blog. 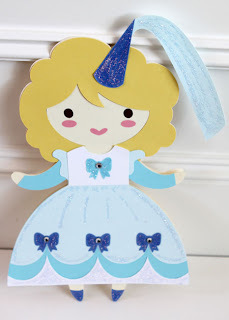 I started this blog so that I can have a log of the cards that I make but 2 months after I started it, I began to feel a little weird "talking" to myself. Hence I asked if some fellow Cricuteers can take a look. 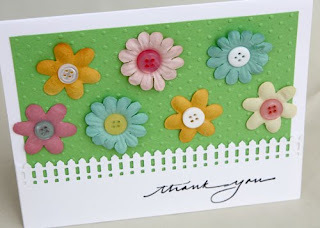 Thank you all for stopping by and thank you so much for all the kind comments that you've all made on the board and on my blog. I am blown away by the response. I had 1 follower this morning when I posted and now I have 35. I am so very flattered that you find my blog worthy of your following. Thank you again, everyone and Welcome to my blog. 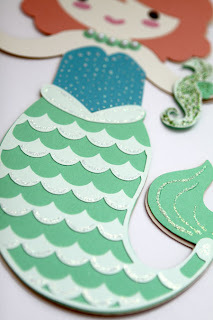 So I had to make a 3rd card and this one was cut at 9.5" but the tail is big so the resulting card ended up a tad bigger than the first 2 cards. 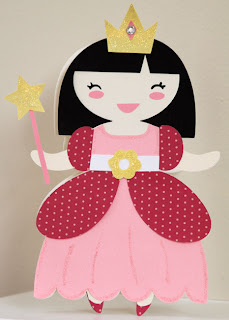 So here's another super-sized card that I made today with Once Upon A Princess. It is also cut at 10.5" and again I welded 2 bases with Design Studio to get one card base. 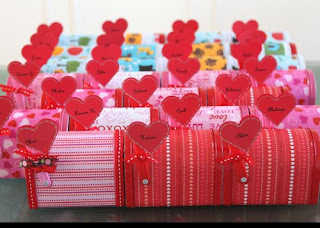 After making those jumbo Valentine's Day cards yesterday, I was not able to shake off the notion of making more large size cards. 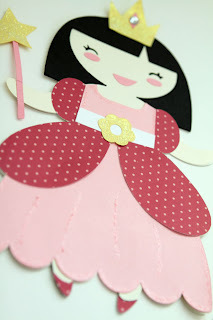 By applying the same concept of flipping and welding two shadow images, I came up with this super sized princess card. 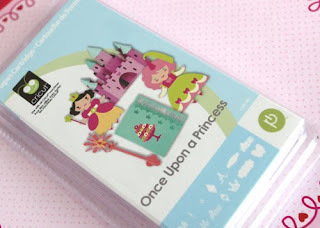 I used the Once Upon a Princess cartridge and welded the shadows together with Design Studio to get the card base. It is a big card. The image was cut at 10.5 inches on the 12"x24" mat. 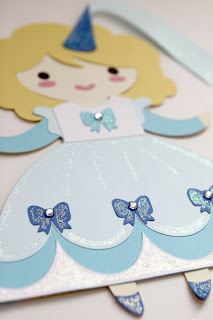 I used Stickles to apply some bling to the card. It took some work to get the card base all welded up and I did make some mistakes along the way but I love the end result. I think I'll work on another one of these jumbo cards tomorrow. 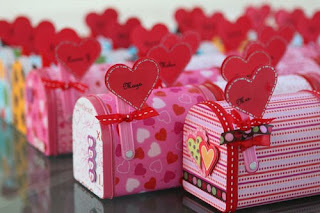 26 Mailboxes all dressed up and delivered! Unbelievable! 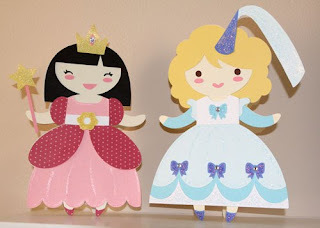 I ordered Once Upon A Princess from CricutMachine.com on Wed the 3rd and it's here in my mailbox today! I'm so excited I can't wait to play with it. 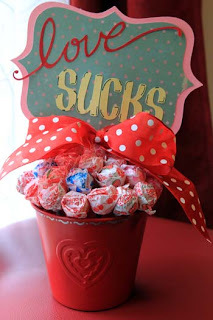 11 days till Valentine's Day. 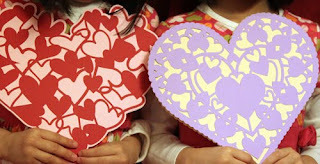 9 days till 1st Grade V.Day Party. 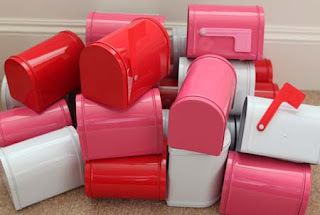 and I just found out that the Teacher expects to have these mailboxes by Monday the 8th! So, it's really just 5 days till Mailbox delivery day. Can I dress these babies up by Monday? 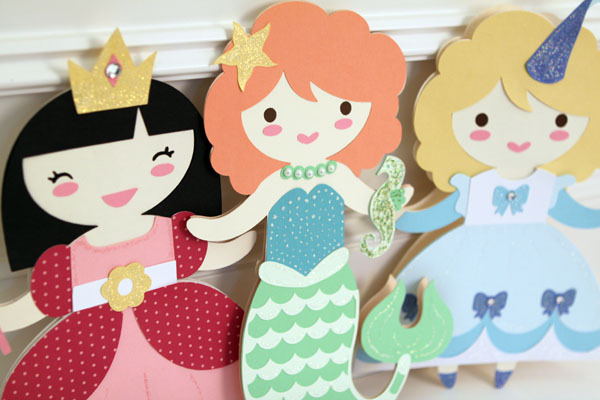 I love Lettering Delights' and I am just smitten with their Love Pets collection. The images look like they'll be good candidates for cutting with MTC and I wasn't wrong. 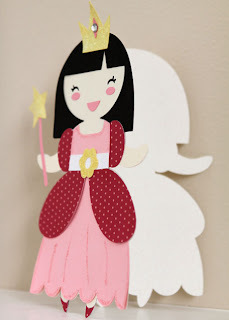 I spent a lot less time cutting out the sheep than I did the polar bear or the eskimo girl. 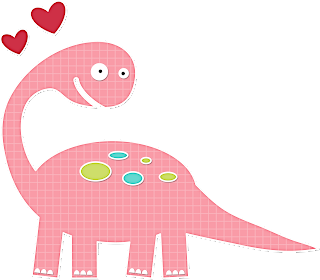 This dinosaur was is by far the easiest to cut. I only needed to make minimal cleanups before tracing it in MTC and cutting it out. I'll update this post later with a picture of the cut out I made.